This pavilion was built as a homage to Her Royal Highness Princess Srinagarindra, the Princess Mother upon her 90th birth anniversary in 1990. There are two rooms with glass panels inside the pavilion, one on each side of the principal Buddha image. In the room on the right is a wax figure of Her Royal Highness Princess Srinagarindra, the Princess Mother at 90 years old, seated on a chair under the ceiling decorated with carved wood images of the twelve zodiac signs. In the room on the left are two wax figures of His Royal Highess Prince Mahidol of Songkla and Her Royal Highness Princess Srinagarindra, the Princess Mother. 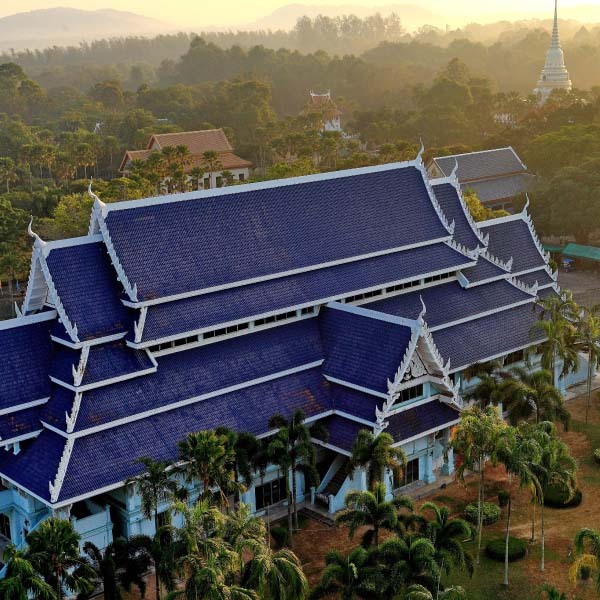 At present, Somdet Phra Srinagarindra Boromrajajonani Pavilion is used for the training of young Buddhists and people who attend Dharma training sessions in large groups.